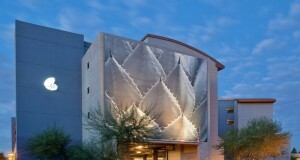 Old Town Scottsdale is known for it’s hip and trendy nightlife attitude. Nowhere is this more exemplified than at the W Scottsdale Hotel. As soon as you arrive at this ultra posh location, you’ll feel as if you’ve been transported to a party. The covered entrance to the W sports diagonal columns leading you in a roundabout. You can park yourself, or let the valet take care of it. The parking garage is underneath the hotel so your car stays cool underground. Opened in 2008, the W Hotels are worldwide and are managed by Starwood. Step into your room at W, and the words wonderful, spectacular, and fabulous are sure to come to mind. The suites will inspire words like marvelous and wow. That’s because each room has it’s own unique name of those just mentioned! All rooms except the wonderful include floor to ceiling windows so that you can enjoy views of Camelback Mountain or the WET Deck. All the rooms have the signature W “floating” feather bed with 350-thread-count sheets, goose-down comforter and pillows so you can have the best sleep of your life. Bathrobes, flat screen TV’s, and high speed internet are all to be expected. Bring your pet along too because W has a Pets Are Welcome P.A.W. Policy. It’s lots of fun for both you and your pooch to do yoga, and get massages together. Perhaps the best part of it all is that there is a button on the phone for the Whatever/Whenever concierge. This service takes concierge to a whole new level. With just a click, they’ll be there to deliver food to your room, get you tickets to a Sun’s game, recommend the best dog parks, or dog sit during the day. If you get a sushi craving at 2 a.m. they’ll take care of you, if you’d like to have a private shopping spree at Scottsdale Fashion Square, just let them know. Your wish is their command. When you feel you’re ready to get out of your room, there’s so much to do. To continue relaxing, head to Bliss Spa. As nice as it sounds, Bliss is a retreat for the senses. With a relaxing yet upbeat and fun atmosphere, you’ll find everything here extraordinary. From facials to laser hair removal to massages, Bliss will pamper your entire body. Have no fear of starving. From their spa snacks to their signature Brownie Buffet, you’ll be sure you’ve died and gone to heaven. There are separate men’s and women’s lounges, a luxe nail lounge, and even a retail boutique so you can take some special products home with you. If this all sounds like the place to be for you, consider staying in the Spa Room which will add extra Zen to your whole experience. There’s no need to be hungry at the W. Sushi Roku is an award winning Scottsdale restaurant. 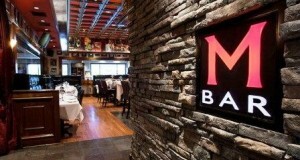 Have a seat inside, and get ready for some Omakase dining that the chefs will design based on your individual likes. If seafood isn’t your favorite, try the filet mignon or 14 day aged ribeye instead! If relaxed drinks are the choice, the Living Room Lounge is just the place to kick back and enjoy a cocktail or two with your friends. Of course there are munchie boxes in the rooms for those in between times, or let Whatever/Whenever recommend the very best restaurants in the area. If you’re traveling, don’t worry about figuring out directions or dealing with a rental car. W’s Acura Service will chauffeur you around in an Acura MDX to anywhere you’d like to go. This way, you can be sure to arrive in style no matter what. When you’re ready to party the Scottsdale way, you might want to head to Shade Lounge and Bar. This indoor/ outdoor bar features fire and water elements that complement the desert. 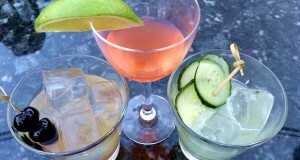 Innovative cocktails and wine are sure to please while live DJ’s spin euro-inspired sounds. Mix, mingle, or reserve your VIP table with bottle service. Be sure to dress to impress especially in the evening at this upscale lounge. Leave the collared shirts at home though for the WET pool deck. Open 24 hours every day, this is the perfect spot to get a tan, or take a midnight dip during the summer when Scottsdale is still hot even at night. Located on the roof of the W, you’ll get stunning views while relaxing in your lounge chair or cabana. Just be sure to arrive early as they fill up fast! DJ’s spin on the weekends for your listening pleasure. Of course, if you need to work on that beach body a little, visit SWEAT where you can workout on some stellar equipment. If you’re more of a business minded nature, the W is the most forward place to hold your meeting. Get ready to impress the younger generation of wired business people with the W meeting spaces. Don’t worry if you yourself are not that tech savvy. They’ll take care of everything and get it all hooked up so you come out looking like a genius. If love is in the air, what better place to tie the knot than at a place that complements your lifestyle? Gather on the WET deck with views of Camelback Mountain, or decorate to your liking in the Grand Room. You can be sure that you and your guests will have the time of their lives at your sleek, modern nuptials, and because the W is worldwide, why not escape to a different location that night for the honeymoon? If you never want the party to stop, it doesn’t have to! There are 18 unique rooms on the top two floors of the W that are residential. With one or two bedroom condos, you can own your own little piece of the W and be close to everything Scottsdale has to offer. Take advantage of the concierge, valet parking, and everything else you’re entitled to as a guest of the hotel when you’re a home owner. You’ll never run out of things to do or people to see, and just imagine the looks on your friend’s faces when they learn that you actually live there. Plus, with access to all the events and happenings at the W, you’ll never have to worry about where to crash for the night. Don’t be surprised if you bump into a few celebrities. Players like Larry Fitzgerald, and Charles Barkley, and movie stars like Luke Wilson have all been known to make appearances. 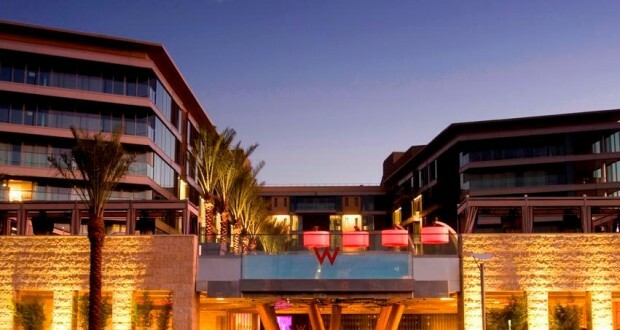 Spend even an afternoon here, and you’ll see why the W is Scottsdale’s hot spot.